Pearls are organic gemstones that are formed of shelled molluscs, bivalve oysters and mussels. They are made up of nacre (mother-of-pearl), which is mostly made up of aragonite (calcium carbonate) and conchiolin (complex proteins from mollusc shells). The name ‘pearl’ was believed to have come from the Middle English word ‘perle’, which actually came from the Latin word for leg, ‘perna’. It was thought to be due to the shape of the bivalve mollusc. Pearls can come in many different variations of colour. They can come in white, cream, silver, golden and many others. Some pearls show signs of iridescence, known as orient. Natural pearls are particularly rare, expensive and quite small in size. Because of this many people have come up with different ways to culture pearls, to ensure that these beautiful gems can be enjoyed by everyone. One of the many beauties of pearls is that they can be taken from the mollusc shells fully formed with a perfect lustre without having to be cut or polished. These pearls can be found typically in cultures waters around the world such as Australia, Japan, Central America etc. Natural river pearls are usually found in Asia, Europe and North America. The earliest record of pearls within history is the ‘Umm AI Quwain Pearl’ which was believed to have been found around 7,500 years ago in the UAE. 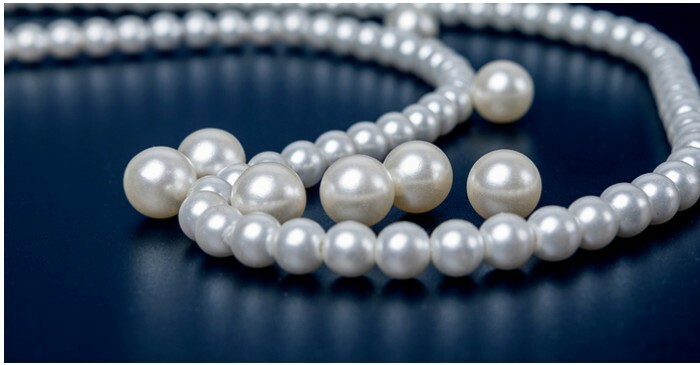 Before pearls were ever cultured by man, they were first harvested from the Persian Gulf, Sri Lankan waters, fresh waters in China and the rivers of Europe. It was later that Christopher Columbus discovered pearls in South America. When this demand for pearls became un-sustainable the Chinese and Japanese began culturing pearls. It was once believed by the Chinese that pearls protected them against fires and dragons. Even now pearls are highly regarded and are of continuing value in many cultures across the world. There are many superstitions associated with pearls, for instance it is believed that pearls can represent tears and as a result should never be given as a gift, an engagement ring or be worn by a bride for her wedding day, to ensure that the pearls cause no sadness. On the other hand many people think that pearls are a perfect item of jewellery for brides to wear as they believe it represents purity, honesty and loyalty. Pearls are very expensive gemstones; since the supply is decreasing and the demand is increasing they are becoming a rarity, hence causing them to become increasingly expensive. In 2011 the price for a 50.56 carat pearl, known as ‘La Peregrina’, was sold for around $11.8 million. ‘The Baroda Pearls’, which were a part of the Maharajah of Baroda’s necklace, are a double strand of 68 individual pearls that sold for around $7 million in 2007. Pearls have also been worn by famous actress and royalty, Elizabeth Taylor. Saga warns on profit, slashes dividend on insurance..
Proxy advisers ISS, Glass Lewis back Bristol-Myers..
From farms to slums, Indian women on sharp end of jobs.. Drill, China, drill: State majors step on the gas after..